The largest coal producing countries are not confined to one region – the top five hard coal producers are China, the USA, India, Australia and Indonesia. Much of global coal production is used in the country in which it was produced; only around 15% of hard coal production is destined for the international coal market. Surface mining is only economic when the coal seam is near the surface. This method recovers a higher proportion of the coal deposit than underground mining as all coal seams are exploited – 90% or more of the coal can be recovered. Large opencast mines can cover an area of many square kilometres and use very large pieces of equipment, such as draglines, power shovels, large trucks, bucket wheel excavators and conveyors. 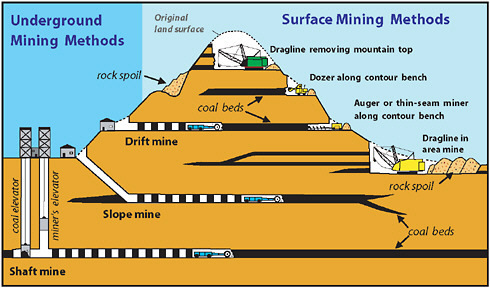 Longwall mining involves the full extraction of coal from a section of the seam, or ‘face’ using mechanical shearers. The coal ‘face’ can vary in length from 100-350m. Self-advancing, hydraulically-powered supports temporarily hold up the roof while coal is extracted. When coal has been extracted from the area, the roof is allowed to collapse. Over 75% of the coal in the deposit can be extracted from panels of coal that can extend 3km through the coal seam. A brownish-black coal with generally high moisture and ash content and the lowest carbon content. Significant resources and mining operations are in Texas, North Dakota and Montana. Coal with higher heating value than lignite. Wyoming produces the bulk of sub-bituminous coal in the Powder River Basin (PRB) area. Soft, intermediate grade of coal that is most common and widely used in the United States. It is mined mainly in Appalachia and the Midwest regions of the US. The hardest type of coal, consisting of nearly all carbon. Mined in the Appalachian area of Pennsylvania, it has the highest heating value and lowest moisture and ash content. Coking coal is a bituminous coal with special characteristics that allows it to be converted into coke and used in the steel manufacturing process. Coal provides America’s railroads with more traffic and revenue than any other commodity. A typical train car holds between 115 and 117 tons of coal. Wyoming is the largest coal-producing state. Coal accounts for half of the electricity use in the U.S.
Coal costs less than any other major fossil fuel source. The world’s largest producers and consumers of coal are China, Poland, Russia, India and the United States. Total world consumption of marketed energy is projected to increase by 57 percent from 2004 to 2030. Coal’s share of total world energy use climbed from 25 percent in 2003 to 26 percent in 2004 and is expected to increase to 28 percent by 2030.